first backpacking trip with family in Argentinean Patagonia. Nia poked her head inside the tent, where I was spreading out vibrant colored new sleeping bags on neon yellow new sleeping pads. I looked up at her and her two thick long dangling braids. My brain started to schedule a hair wash time but was interrupted immediately by the sight of her scrunched up nose. “Eewww!! It is so stinky in here, what did you do?”, she exclaimed withdrawing her head quickly back. What a relief! Her proclamation eased my fear of developing phantosmia, a condition where you smell imaginary smells. My nose was being assaulted by a real stench for last thirty minutes whereas my eyes were feasting upon pretty colors of our new backpacking gear. I stepped out of the orangeish-silver-grey four-person backpack tent to rescue my nose. The air was fresh and crisp, the foliage was lush green from yesterday’s rain, and the sky was deep blue dotted with soft puffy white clouds. I started walking down to the stream reflecting on the events of the past year that have led us here. Navjot and I share an intense yearning to hike the beautiful trails around the world. We had waited patiently for kids to get strong enough to walk about 15 km a day and carry their backpacks. Our wait was finally over, and here we are with our nine and five years old kids ready to fulfill our dream. It was a momentous day for our family. It was the beginning of our journey to explore the beauty of our planet. We were at the Campamento Poincenot in the impressive Fitz Roy range in Argentinean Patagonia in late December. It was our first backpacking trip! Our household was swelled with anticipation for past four months. The biggest challenge was to choose one place to travel from the entire planet. All of us had different favorite places, luckily most of them were ruled out due to winter. We watched 180° South movie and our decision was made. And now it was time to get into action. Navjot relished every moment of reading about backpacking gear and watching videos. Kids were thrilled about every REI trip and testing tents in the store. I was delightedly engulfed in planning details. We planned, made lists, and gathered everything which was deemed essential for our first backpacking trip. Tickets were bought, buses and hotels were booked. Backpacks were carefully stuffed with newly purchased gear as per the packing list. Neighbours were warned about the upcoming three weeks when they would be deprived of our fabulous company. On a December morning, we reached El Chalten, Argentina’s trekking capital, the gateway to Los Glaciares National Park. It was a long journey from home – a flight to Santiago, then another flight to Punta Arenas, then a bus to Punta Natales, and one more bus to El Chalten. Next morning we were ready for our “test” backpacking trip to the Fitz Roy. This one-night backpacking trip was supposed to prepare us mentally for seven-day long “W” trek in Chilean Patagonia. We started out in the forest on a steady uphill. The beech trees created a thick mosaic canopy that shielded the view of the mountains, creating a game of hide-and-seek with the peaks. At the first mirador/vista point, we could see Fitz Roy drifting amidst few wispy clouds, while Poincenot stood bright and bold to its side. It is the utter ruggedness and harshness of the landscape and environment that makes Patagonia so utterly astounding. Kids running up the trail carrying their backpacks was an absolute blissful sight. I was reveling in my extraordinary fortune, my heart bursting with the overwhelming beauty and emotions. We sang, talked, admired, stopped, took photos, ate protein bars, walked and reached our destination for the night, Campamento Poincenot. There was only one more tent there, without any occupants. We pitched our tent, which we had already practiced at home, twice. We made tea for ourselves and hot chocolate for the kids. I unpacked sleeping bags, while Navjot appointed himself in charge of the food department. Everything was going on perfectly so far, until that dreaded smell in the tent. We had thought of all the situations, rain, hail, wind, snow, wild animals, but not how to deal with a smell in our tent. I walked back to the campsite to consult with Navjot, our first night in the tent was not supposed to be stinky. Nia, Navjot and I were on a mission to find the source and eliminate it, while Laddu was busy collecting sticks. We sniffed around our tent to refine the scope of our search area. It was definitely something around our tent, we checked it, nothing. Navjot suggested to move the tent and started taking off tent fly. And there it was, the source of all this distress, in its full glory, delivered there not so long ago by our son! He assumed the area between tent and tent fly was to attend nature calls. Oh well, that’s what happens when you trust your little one to understand the application of “leave no trace” principles. Peace was restored after we used our newly bought shovel for the first time. Poor Nia has to attend a quick refresher on backpacking etiquettes along with Laddu delivered in calm voice by Navjot. We spent an intimate and memorable night together as a family, packed together in a tiny tent under the Patagonian sky, sharing jokes, stories and teasing Laddu. The next day we woke up at dawn, ate a breakfast of oatmeal and left to climb up to Laguna Torre, to the base of the Cerro Torre. There was no other hiker on the path, absolute silence with just the soft hiss of the wind, a perfect temperature, and jaw-dropping scenery. I couldn’t wait to see the top and be rewarded with a supposedly gorgeous view of a postcard-perfect Patagonia. I love mountains, particularly sheer and dramatic ones. They stir a potent mixture of intimidation and excitement which makes me truly alive. We crossed the suspension bridge and raging Rio Blanco. Slowly the trail led out of the forest onto the barren scree slope steeply up to first a false crest, and then shortly after the crest proper. We continued walking to frozen Laguna de Los Tres with the impressive Fitz Roy massif high above hidden in the clouds. We did not get a glimpse of Cerro Torre, instead marveled at the contrasting landscape around us and famed granite massif, revered by the climbers. We imagined the beauty of the magnificent glacial lake, which turns turquoise in summers. Kids were awestruck by the immensity, colors, and beauty of the landscape. They were expressing their joy by jumping around, throwing stones in the lake, fishing out big ice chunks from the lake and tasting the pure glacier water. Drinking water directly from the source turned out to be a surprising, intense emotional experience for me. It was not just the incredible taste of freshest Patagonian, it was the utter feeling of oneness with nature, which triggered something inside me. Perhaps, it was an ancient memory in my genes coming alive. We walked back to the campsite, packed our bags and started walking down to the El Chalten. The clouds had been toiling and roiling over and around the peak since we started hiking back. They curled up and down and over the peak, descending upon it, and then rising again. We were stopping frequently to turn around and gasp at the ever-changing colors of the Fitz Roy, as the sun was slowly setting low. And then, suddenly, Fitz Roy emerged framed in pillows of clouds, grand and mysterious, and then quickly disappeared once more. I got in horizontal position to watch the clouds playing games with mountain peaks. With the camera set on a tripod, Navjot sprung into action to capture those fleeting moments. Kids were already busy throwing pebbles in the creek. The movement was endless, unpredictable, and cast the peaks in different lights and angles. Fitz Roy was majestic in its brief appearances from the clouds. I had been taken on a journey of light and shadows. Captivated by the clouds and the light show, we lost our sense of time. It was getting darker, and we were hungry. By the time we finished the hike, it was about 11 pm, we gave up any hope of a hearty dinner, as we had been promising to the kids. Our backup plan was to ask Anita (of Anita’s House, where we were staying) for some bread and cheese or butter and hope for the best. Lest we knew that the folks at El Chalten had already thought about tardy hikers. Cerveceria Artesanal, a restaurant on the way to Anita’s House was open until 2 am. They filled our tummies with their most delicious food and warmed our hearts with their smiles. And now it was time to hit the sack, and to be ready for the next day to discuss lessons learned from our first backpacking trip. I am sure we all have many moments from our backpacking trips with kids. Share your funny story in the comments below. Loved reading this – You describe so perfectly your emotions. We are in the same position…our kids are just getting old enough to do some longer hikes. 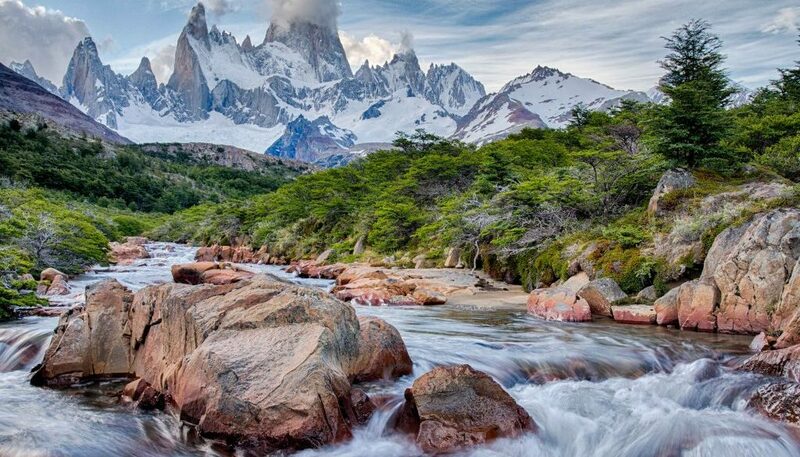 We are planning a trek in Nepal for next year but Patagonia is definitely on our bucket list too. Himalayas are incredible! I have been hiking all over Indian side of the Himalayas with kids and each year we try to go higher than the last. Kids are almost addicted to high altitude hikes. All the best for your Nepal adventure, we love this country. We love to hike, and I really would like to bring the grandkids on their first backpacking adventure too. This looks amazing. Thanks Melai, it was a new and beautiful experience for all of us. This is such a heart warming story! I can see myself and my husband in your words. We love to plan and share ideas for our upcoming trips. It has to be fun to plan a trip when kids have a say on that. I know kids with bucket list and it is very interesting to talk to them about the places they want to visit. What a beautiful photo. i missed climbing and camping even more.Awesome experience you share with your family. I’m not a hiker and need an actual bed to sleep but your hike seems like quite a journey. My gosh this long hike with a 5 yr old, you preparation speaks a lot about that. I love that glacial lake, it’s mesmerizing, a combination of ice, blue water and brown mountains surrounding it is just so picture perfect!! Thanks Shivani. I am fortunate that my kids love hiking, they bring so much joy to it. Such a wonderful experience. This is exactly what I plan to do with my kids and family as they grow up – the first backpacking trip together is really one which is cherished all through the life. I will save your post for future reference. Thanks Neha, love of outdoors is the best gift we can give to our kids and hope they will treat this planet better than we did. Oh my, that’s awesome to go on such adventures with your family. The scenery seems like it was totally worth it. Hmm, drinking pure glacier water….coming to think about this, i should add this to my bucketlist!! Glad you had found an open restaurant that avoid you from having the bread and butter!! All the best to you and your loved ones! Thanks Sylvia! Kids are so much fun to travel with, I can’t imagine traveling without them. I just watched 180 South for the first time recently, and it also made me want to go trekking in Patagonia. How wonderful that you and your family were able to do so. And the photos are stunning!